The connection between kids, their food, and farming seems to be a natural relationship and it’s great to see the strong support for that relationship here in the City of Kingston. ‘Urban agriculture’ has become very popular and it’s a great opportunity to utilize small, available spaces near population centers to produce food and introduce kids to the source of their food. There are several different programs in the area and the ‘Y’ already has a concentration of kids, a large back lot suitable for farming, and skilled educators like this week’s Doer and Dreamer to introduce kids to the origins of food that they see on their table. The public can even buy the fresh, local fruits and vegetables that they produce at their farm market at the YMCA or from their mobile market. What is your approach to your business or occupation that makes you unique? I’m an educator with many years of teaching experience and I am able to use this experience with all of the children and young people that come to the Kingston YMCA Farm Project. I love engaging kids in the magical experience of growing food and tasting food right out of the garden. We are committed to distributing our food hyper locally. We sell everything we grow within a mile of the farm, and our focus is on Midtown. The bicycle powered mobile farm stand travels to the two Health Alliance hospitals and then to the Kingston Public Library. It also makes a stop at Yosman Towers and the Governor Clinton Apartments. We also have a farm stand at the YMCA. We focus on co-locating our farm stands where people are already gathered and we try to remove as many barriers as possible that prevent people from accessing fresh, local food. I’m originally from Tulsa, Oklahoma and lived there until I moved to New Orleans to go to college. After college, I moved to New York City. I’m a proud Okie! I moved to Tivoli in Dutchess County to work on a farm. I lived on that side of the river for about 8 years. After living in rural areas, I was ready to move back to an urban area. My partner and I were both working in and around Kingston. I had a crush on Kingston for a very long time. 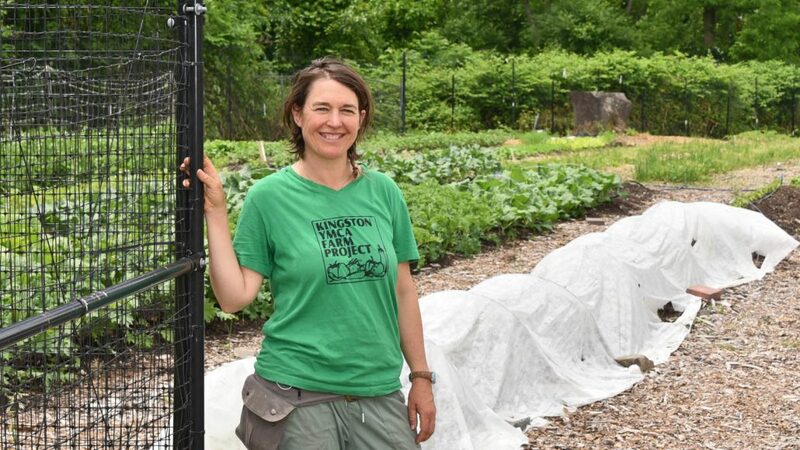 When we decided to move here, I knew I wanted to be farming and wanted to transition to urban farming and wanted to be more rooted in education and community work. The Kingston YMCA Farm Project is my dream job and it definitely keeps me here. The George Washington School where my son goes is a special place and it keeps me here. The mountains, the river, the people all keep me here. It’s always changing, but any place with a hiking path. I love visiting any city and checking out the farmer’s markets, the coffee shops, the parks and public spaces. This winter my family went to Cali, Colombia and we loved it for the amazing fresh fruit, the salsa music and dancing, the park that filled up with people every evening and the delicious food. In college I majored in German.